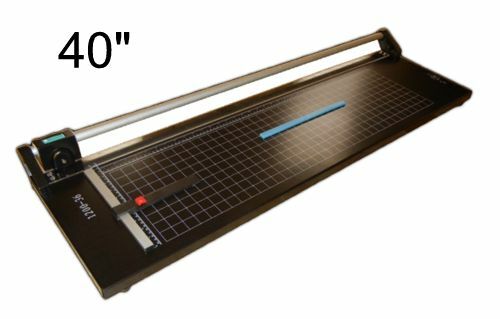 Perfect RT40 Rotary Paper Trimmer. This 40" rotary trimmer can be used for a variety of small office/home office functions and craft projects including cutting various kinds of photo paper, film, card stock, standard paper, art design paperboard, hot and cold laminating paper, thin plastic boards, thin copper sheet and much more. Included Free is a magnetic strip that helps hold the cutting material in place, plus an extra premium carbide blade that will cut as much as 8-10 sheets of standard 20lb paper. Comes with rubber feet for desktop use. Size: 47.5" x 14.5" x 4"
Measuring Grid: 12" x 36"
MBKP International agrees to repair or replace, at its option, any defective part or component covered by this warranty, provided there is no evidence of abuse and we first receive written notice via email of a defect within the applicable warranty period. Wearable items are not covered under warranty. Wearable items include, but are not limited to; blades.This warranty extends only to the original purchaser. MBKP International makes no further warranty of any kind and specifically disclaims any warranty of merchantability for a particular purpose.